Edible Landscaping- go graze in your yard. Edible landscaping is slowly taking a hold in urban areas. It makes sense to use all available space to create food especially when there are so many people in inner city areas that don't have access to good nutrition. I want to talk about edible landscaping in your own back yard where you can grow more food than you ever thought possible outside of your veggie garden. When you think about it, it is really easy to make alternative choices when putting in trees and plants around your home and yard. 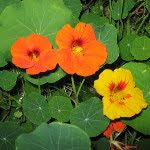 Flowers that are beautiful and edible are nasturtiums , violets, marigolds, and all herbs can do double duty as many have delicious flowers such as chives, lavender, and marjoram. The list of edible flowers is long, so do your research. 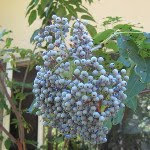 Accent plantings around buildings can be berry bushes such as gooseberries, seabuckthorn, blueberries and currents. They might need a little pruning to keep the shape you want. Tall bushes and shrub trees can be elderberries seen here, and figs. 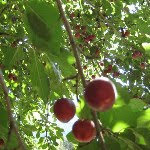 Treescaping should include fruit and nut trees, such as apple, plum, cherry, walnut, and hazelnut. 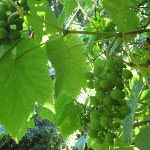 If you have a patio area that is too hot to be fully enjoyable, cover it with a trellis and grape or kiwi vines. It will be transformed into a cool, green grotto. Paths around the garden and leading to the house can be lined with kale, ornamental cabbage, lettuce and herbs. Often paths around houses are shady so using lettuce is ideal. There is such a huge variety of lettuce with different colours, shapes and flavours, it is a wasted opportunity to not use it for accent. Backdrop plants that can be a bit taller could be wispy dill or garlic. Both are excellent for pest control. Dill attracts aphids which in turn attract lady bugs, one of the best garden bugs to have. The dill could be a sacrifice plant, as even if it's covered in aphids, it looks fine and is attracting aphids away from other plants. Garlic is wonderful to plant with roses as it repels all kinds of pests. The garlic makes beautiful big flower heads in late summer and is an attractive background plant. If you have a plain wire fence between your neighbour's place and yours, a great way to provide privacy is to plant scarlet runner beans all along it. The bright orange/red flowers last a long time, and the result is mountains of vegetables you can share with your neighbour. Think about removing some (or all) of your lawn and replacing with a low maintenance ground cover such as orange scented thyme. It can't take heavy traffic but it is lovely to brush against to get a burst of gorgeous scent. If you like to have pots flanking your front door or leading up your stairs, planting them with a bush type of cherry tomatoe, purple basil, variegated lettuce, and maybe a flower or two, you have a fully edible accent you can nibble on as you leave or return home. I did pots with only kale one year for a green accent, they were beautiful. The small leaves are tender to eat fresh, and the larger plants are perfect for cooked dishes. A couple of years ago we planted an amazing Moon Garden with all white flowers. 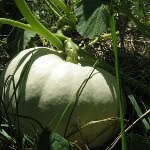 It was lovely but I wanted something more edible so last year I planted it with white variety pumpkins. Of course the leaves were green and it didn't glow in the dark until the leaves had died down showing off the glowing white pumpkins but it seemed a fitting tribute to the Moon. The things to remember when building a house for your chickens are many and varied. First, though, it should be cute. You will be looking at it summer, winter, sun, rain, mud.. etc. Make sure it kind of melds into the landscape around. My cousin gave us some left over green metal roofing from his house. I had some cedar slabs that I used for siding. It is rustic, but blends in well with the surroundings. It should be bigger than you think you need because, depending on where you live, they don't really need warmth so much as air circulation and space. This chicken house has 2 windows that are covered in hardware cloth ( a tough wire mesh) and shutters to close completely during the cold, windy nights in winter. It needs roosts, laying nests, (one for every three hens) and an escape route if a predator gets in during the day when the run door is open. (We once had a skunk get in there, it ended badly) We leave the "people" door open during the day specifically for this reason. It also helps with cleaning out the chicken house to not have a door jam threshold. 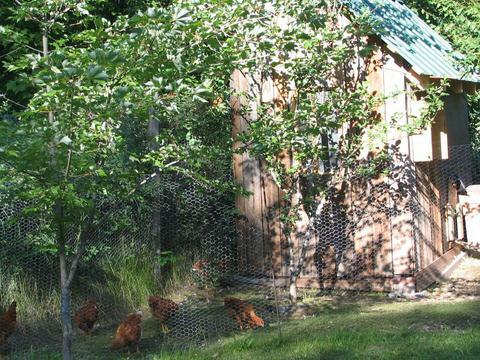 The run should be secure on the bottom as chickens will dig under anything and undermine the fence line. I had some old iron slabs that had been lying around on the property for years. I left some of the chicken wire laying on the ground (about 8 inches) and put the iron slabs on top. They can't dig under that. I also put some deer netting over the whole top of the pen, as we lost a chick to a raven that first year. It keeps the chicken hawks out, and the bantees in. They love to have a dry area to dust bath in (necessary for keeping mites and fleas at bay) so having a good deep overhang on the roof works well to keep some of the ground dry. A full on veranda is planned for them, but, low on the list. Make sure the door and any windows are very secure at night. Bears can get into almost anything so the harder it is for them, the longer you have to get out there and rescue them! And remember, a weasel can get through a 1 or 2 inch hole, and wreck havoc in a chicken house, so make sure there are no holes anywhere. There should be a feed area where their water and feed dishes are not under the roost or in front of the door and run hatch. Permaculture ideas for the chicken house are- One: having the kitchen compost pile as part of the chicken run. They will work and dig the compost for you, making it process amazingly fast. And they think they are having a party every day when they see you coming with the bucket! Two: having a rain barrel for the chicken house roof, using that for watering them and for any plantings near the area. Happy chickens make lots of good eggs so make sure they are well protected, and you will have a happy flock.